Lizard – even the name’s a clue that this is a pretty special and unique place. There aren’t many places around the UK named after a squamate reptile. But don’t be deterred. This Cornish village is as warm and slow-paced as the lizard is cold-blooded and swift. It’s actually named after the Celtic ‘lys ardh’, meaning ‘high point’. For starters, the location of this village is magical. It’s the most southerly point of mainland Britain, the ‘toe’ of a peninsula on the south coast of Cornwall, making it a little paradise set apart from reality. This Lizard is the village, the furthest settlement on The Lizard, the general name for the whole of this amazing peninsula. I first came here several moons ago, free to follow a whim after work on a Friday. We arrived late at night in a tiny car low on the axles with camping gear and miniscule Jack Russell puppy. It was dark and a real pea-souper, fog rolling in off the Atlantic so thick you could hardly make out your hand in front of your face. Creeping down to the village, headlights faintly tracking the winding hedgerow, The Top House Inn loomed out of the mist. Locals at the bar nodded wearily – in the manner of having done the same thing most nights – in the direction of the hand written campsite sign we were after. Classic amateur campers’ error: we hadn’t thought to practise pitching our shiny new tent. After an hour wrestling writhing poles and yards of nylon in the feeble beam of a dying torch we flopped exhausted into sleeping bags. That lighthouse fog horn boomed eerily into the darkness every 30 seconds, every time we dropped off, until the early hours of the morning. But, wow! When we emerged bleary eyed from the tent, no idea where we were, who could stay grumpy in the face of green fields and turquoise sea below cotton wool puffs of cloud in clear blue sky? I’ve returned to Lizard village many times since then, but confess that cosy (and well insulated) cottages have made a welcome substitute for the canvas! The Top House Inn has become our favourite ‘local’. Friendly and unpretentious, you can cosy up beside the fire whilst choosing from the tempting menu; seafood’s always my choice here, staff can even tell you the name of the boat (sometimes the fisherman) that landed it. Dogs are just as welcome as visitors too. Friendly as the village is, no one pretends it’s the main attraction. It’s the path that leads from the village down to Lizard Point that is your yellow brick road. At the end of the half mile path (you can drive if you like) is Lizard Point and this is where it gets interesting. Peer over the clifftop – taking great care – and there’s a chance the limpid eyes of a seal lolling on the rocks will gaze back at you, or a basking shark may break the calm waters offshore. And the star attraction is the red-billed chough, seemingly a humble member of the crow family, but actually an icon of Cornwall, part of the county’s coat of arms and sensitively reintroduced to these cliffs following ‘extinction’. Keep your twitcher’s eyes peeled. A lavish cream tea on the terrace at the Polpeor Café is a delicious traditional Cornish diversion whilst you wait. All this is set amid sparkling sunlight on white horses breaking from turquoise depths and colourful drifts of wildflowers in shades of pink, blue and white, from sea campion to thrift and wild asparagus. The tranquillity of the coastal landscape, best enjoyed whilst walking the South West Coast Path from the Point, seems at odds with its reputation as the ‘sailing ship graveyard of the sea’. But gaze down more closely at the shoreline and relics of old lifeboat stations are clues to the ships that have been doomed on the treacherous rocks off the Lizard. Silver coins from a wrecked 17th century Spanish galleon are said to still wash ashore at nearby Dollar Cove. 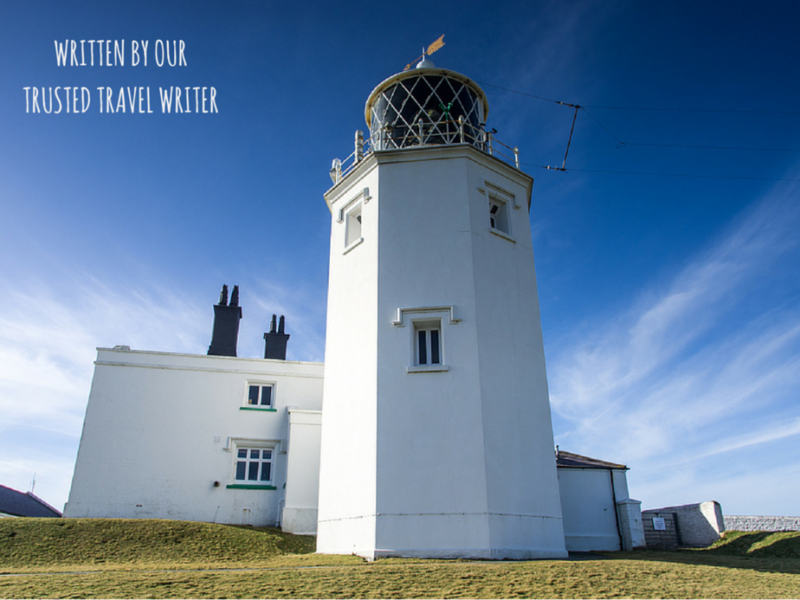 Don’t miss the chance to visit Lizard Lighthouse and Heritage Centre, where you can climb to the top – it’s worth the puff – to see the light on the spot that has guided sailors home for nearly 300 years. For one of the most beautiful beaches in the world, head for Kynance Cove two miles away. I’ve stumbled up and down the steep path from the National Trust car park dragging bodyboards and small children many times, but it’s always worth the stony flipflops and echoes of “Are we nearly there yet?” Pretty pink and green serpentine stone along the route is a great diversion. My favourite time to visit is just after sunrise when yours are the only footprints across the beach. Once we retreated silently from the doleful gaze of a fluffy white baby seal pup lolling in a cave in the early morning – a magical sight to chance upon. Driving home to the ‘real world’ from a break in this amazing never-never land comes as a bit of a culture shock but, once discovered, it’s never long until you’re heading back for another heady dose of Lizard magic.